I spent my Saturday at Florence + The Machine’s latest tour, and left confident that I had seen one of the greatest performers alive. 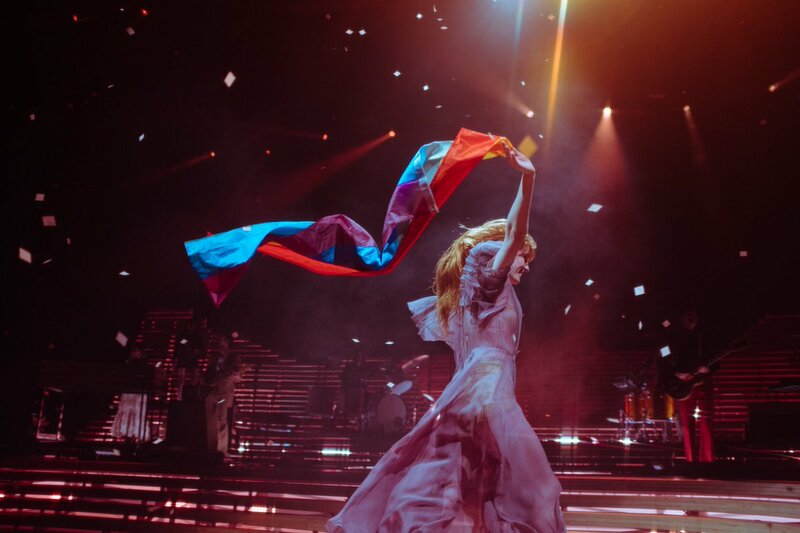 Florence Welch, joined by her multi-instrument and choral band, The Machine, require little other than a stage and a microphone to captivate the sold-out room. Welch is as unable to stand still while performing as previous tours, but every movement seems effortless and necessary – no element of the performance appears forced or staged. Backed up by her ensemble, vocals do not waver despite the energy of the show. There’s no extravagance to the stage, other than lighting and minimalistic sail-like moving canopies. Taking a break to address the audience, the difference between speech and performance is telling. Welch openly admits that she is shy when talking, and that this is in direct opposition to her performance. Still, despite this open bashfulness, she is also able to tell stories about her Glaswegian family, and talks frankly with the audience about everything from the energy she feels in the room, her late relatives, and how we can all use some hope right now. Welch makes fostering that bond between performer and audience look like second nature: the nightmare of her security team, Welch spends much of the show running between the stage and the crowd barrier, and on one occasion, runs through the audience. Likewise, she utilises the performance of the biggest hit on the set list, Dog Days Are Over, to bring the audience together. Imploring the audience to embrace strangers and to hold hands during the hit, she manages to connect not only with the audience, but for an otherwise large, faceless audience to connect within itself. It almost feels like the like-it-or-loathe-it arena show was made for a persona as large as Welch, and her interactive, energetic performance certainly left a lingering sense of hope to take away with us into the cold Saturday night.